How many of you have worked on a group project — either at work or in school? How many have been on a project in which the group produced outstanding results? How many have been on a project in which the group produced mediocre results — meaning results that didn’t reflect what the group was capable of given the talents of the people involved? What do you think were some of the reasons for this? How many of those reasons are IQ-related; that is, related to the mental or cognitive intelligence of the players in the group? How many of those reasons are EQ-related, that is, related to the emotional intelligence of the players in the group? Group, or better yet, team performance depends on both the IQ and EQ of the members of the team, as well as the IQ and EQ of the leader. Today let’s focus on EQ and a framework for understanding it. From Shawn Achor in The Happiness Advantage I learned this activity. Count off in 1s and 2s. For the next minute, 1s are to look 2s in the eye and show absolutely no emotion for as long as you can. 2s are to look 1s in the eye and smile at them genuinely. Ready? Go! OK, how long were the 1s able to show no emotion? We’re all connected emotionally. Our brains have mirror neutrons that sense and mimic the feelings, actions, and physical sensations of others. Some call this the “limbic dance.” The point is this: the emotions of a group, team, organization, society are not random. You and I can change them. Let’s practice being emotional contributors. First, let’s break into groups of 3-4. Second, let’s ask each group to elect a leader to lead the group for the next 10 minutes. Third, let’s ask each elected leader to meet with me for a very brief conference. Leaders receive a 100-peice jigsaw puzzle and two different index cards that each describes one of the following leadership styles. They are asked to utilize one leadership style for 5 minutes, then switch to a second one. Affiliative: an emotional leadership style that involves the sharing of feelings and emotions; emphasizing individual’s feeling over the task that needs to be completed; and striving to keep people happy and create harmony (the HOW and the WHAT). Coaching: an emotional leadership style that involves having personal conversations with individuals to explore their dreams, goals, and hopes; helping them identify their strengths; and giving them assignments/tasks that allow them to utilize their strengths and reach their goals (the HOW and the WHAT). Commanding: an emotional leadership style that involves providing forceful direction in order to get better and quicker results; taking forceful steps to get things done; and even getting angry with the appropriate person in the appropriate way and time to achieve a goal — putting the goal or task over the person’s emotional health (the HOW). Democratic: an emotional leadership style that involves seeking advice from others to solve a problem or meet a challenge; getting feedback in order to make improvements; and emphasizing collaboration and teamwork (the HOW and the WHAT). Pacesetting: an emotional leadership style that involves leading by example and setting high standards for work effort and speed; this style involves working harder and longer than anyone else and, unfortunately, being extremely task-focused (the WHAT) and relationship-challenged. Visionary: an emotional leadership style that focuses people on the future and the reasons the group is doing something, while leaving it up to individuals to determine how and what they do (the WHY as opposed to the HOW and the WHAT). After the conference, leaders return to their groups and commence acting out their emotional leadership styles while the group works on the 100-piece puzzles. The begin with one leadership style; after 10 minutes they switch to another. 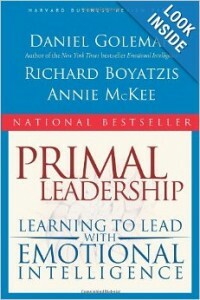 Emotional intelligence depends on the leader’s awareness of her/his own emotions; her/his ability to manage those emotions; the leader’s awareness of others’ emotions; and the leader’s ability to manage the emotions of others–in particular, by choosing the appropriate emotional leadership style. Below is a brief description, goal, occasion, and outcome of each style. Why Care About Emotional Intelligence? Let’s take a biblical view. One lesson from Genesis is that we have been put in charge of God’s creation and are to be good stewards of the resources God has given us. That includes our minds and our emotions. That includes leadership frameworks and the discoveries of science, including Goleman et al’s emotional intelligence framework. One lesson from Matthew is Jesus commands us to love God and our neighbor as ourselves. We all enjoy working in a positive emotional climate. 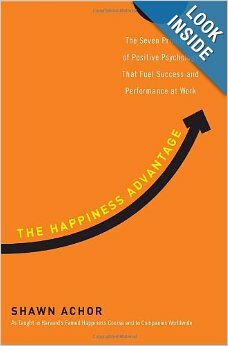 In fact, studies show that in a positive climate we are more creative and better at problem-solving. So how can we love God and neighbor in work group? By providing the right climate for people to be people and do their best work. That means understanding our own leadership styles and adjusting them appropriately at the appropriate times. Because we are all emotionally-connected. Shawn Achor in The Happiness Advantage asks: does success lead to happiness or does happiness lead to success? He argues it’s the latter. While we can’t guarantee success for people, we can do our best to create a happier climate.